Generic Armature to sculpt the head on top of (optional). Here's the video link for making one. I used the 3/8" thick foam to make the giraffe's neck. 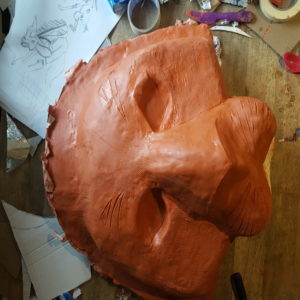 Have been watching some of you films as a part of my preperation of making som papermache masks for a lion king jr production. I Live in Norway. But this one about how you did the giraffe is not available in my country do to the uploaders settings. Can you please make it visible for meg? Sorry about that! Some of my videos are now pay-per-view only (like the giraffe), and it’s price is about .99 US (or 9.00 NOK). 🙂 I fixed it and hopefully it should work for you now. Oh..ok. Thank you. My gigant Simba mask just broke this afternoon so I am a bit upset right now. I spent a week making it. Used wallpaper glue and News paper, and then papercaly..after the newspaper was dry….or so I thought, but when I pulled out the newspaper “stuffing”, the newspaper was not dry at the back and the mask kind of cracked..so I guess I need to let it dry longer og do samethingår completely different with the materias I use. Oh no, that’s terrible. Yes, you have to let the paper mache dry completely. I’ve never used wallpaper glue before, so I hope that will work for you. I’m curious to know why you were using newspaper “stuffing” and exactly what you were doing with it on the mask. Hi there. Wondering, how did you attach the headpiece to the neck piece? I used a combination of hot glue and GOOP or E6000. The GOOP or E6 is what will hold it “forever” once it dries, but in the meantime, use the hot glue to keep it together until the GOOP dries over night. I use that combo for anything that I need to hold together with strength (like the baseball cap when I connect it to the masks). That should say LOVING not living ! One mask takes two to three days to make, depending on the mask. That’s starting with the clay sculpture, then doing the plaster wrap, then paper mache, then painting, then putting on the baseball cap. 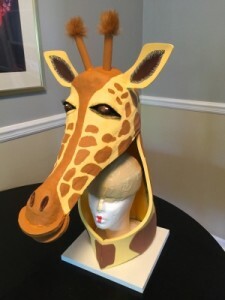 In the case of the giraffes, it takes time to cut out all the foam, paint it, then attach it to the giraffe head. 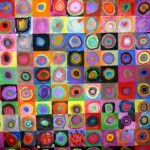 A lot of time is waiting for the piece to dry in between coats of plaster/paper mache, or paint, etc.. Good luck! and be sure to stop back and post pictures of your finished pieces! I have to make 4 of these giraffes. How much of the Closed cell polyethylene foam would you suggest that I purchase? Hi Esperanza, I only used the foam for the necks and for underneath the jaws. It’s been many months so I can’t exactly remember but I think I got the 5 foot sheet. Good luck! and remember to upload some pictures when you’re done!